A great way to spend a half day – or the whole day – in sunny Destin Florida. We have a 45′ private charter boat, comfortable accommodations, and the chance to do some exciting Florida Charter Fishing. We can take between 5 and 15 anglers and can book trips starting at 5 hours. Fishing Just B Cause is also Coast Guard inspected annually and approved for more than 6 passengers – we take your safety and comfort seriously. Give us a call, send us an email or send us a text at 850-830-3619 to make your reservation with the dates you wish to reserve and we will respond right away. *Please note that Just B Cause is NOT a party fishing or head boat, but we are private Destin fishing charters. Destin Charter fishing trips have a great variety of fish, and they are all exciting to catch. To see what some of our other guests have caught, check out our photo gallery here on our website. You will have a good opportunity to catch amberjack, grouper, snapper, sailfish and wahoo. You will have a lot of fun when these hit your line. And it’s even more exciting when you snag one of the other big game fish, such as a king mackerel or even a shark (it happens!). Can we bring the kids fishing in Destin? Absolutely! This is a great way to spend time with the whole family, and kids love Destin Florida Fishing Charters. We have ship mates who will help the kids so that everyone gets in all the fishing they want to do. How far out do Destin FL Fishing Charters go? This is partially determined by how long the charter will last. The more time we have available, the farther out we are able to go. However, one of the advantages of Destin FL Fishing Charters is that the Gulf of Mexico waters get pretty deep without having to travel out very far. So we will be fishing over the deep water in no time. How many hours will we be out fishing? Our Destin FL Fishing Charters range from 5 hours (half day fishing trip) to 12 hours (a very full of fishing). You’re going to be having so much fun catching big fish, you will wonder how the time went by so quickly! I don’t really want to touch the bait. That’s fine – you don’t have to handle anything you don’t want to. Our ship mates will take care of baiting your hook and they will also handle unhooking the fish once it’s in the boat. Your hands never need to touch any of that. Of course, we have some Destin FL Fishing Charters guests who want to do all of that themselves, and that’s fine too. It’s your call. Is there a bathroom on the boat? Yes, we have full bathroom facilities on the boat. We also have all kinds of other conveniences – a full sound system for your entertainment, a microwave, a refrigerator, air conditioning and heating. We even have fresh running water and a full shower if you want to freshen up before getting off the fishing boat. What should we wear? Wear footwear that you don’t mind getting a bit wet. What if I want to take a break from fishing? That’s no problem. Our interior cabin is fully air conditioned for those that want to take a break from the hot summer sun. For the winter days when it can be a bit chilly (especially with a breeze), the cabin is also heated. When you go Destin Florida Fishing with us, you will be comfortable fishing no matter what the temperature is outside. How much does a Destin Florida Fishing Charter cost? The cost of your Destin Florida Fishing Charter depends on how many people are going, and how long of a fishing trip you would like. Check our Charters Rate page – it only costs $250 to reserve our Destin Fishing Charter boat for your dates. What is a private fishing charter? 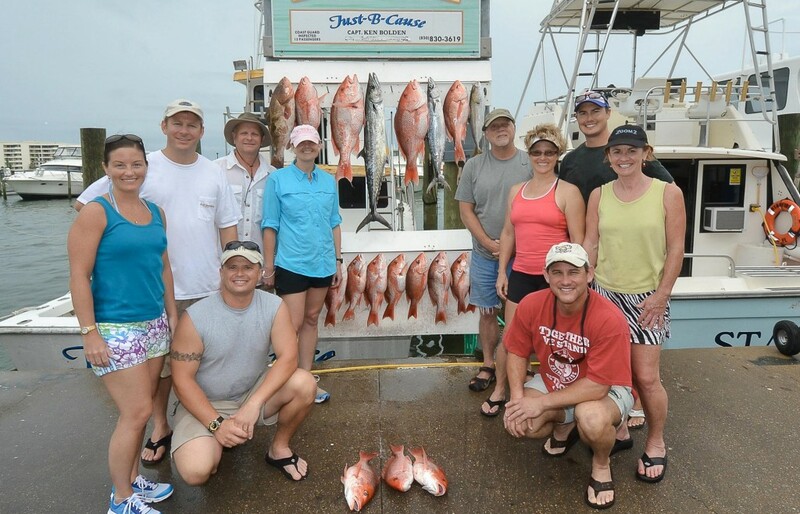 Private charters are exclusive fishing trips for your private group. Private charters are usually scheduled through the captain, and you have the opportunity to remain in direct contact to ask questions. Some particular groups are always encouraged to schedule a private charter over a group charter or party boat. These groups include large families of five, six, or more, work colleagues, wedding, bachelor, and bachelorette parties, and deep sea fishing enthusiasts who have specific intentions that may not be fulfilled on a party boat or group charter.